Is there an Obama Doctrine—a grand strategy based on a coherent worldview that guides Obama’s foreign policy? Pepperdine University professor Robert Kaufman says there is and contends that it is imperiling U.S. interests in Europe, Asia, and the Middle East. 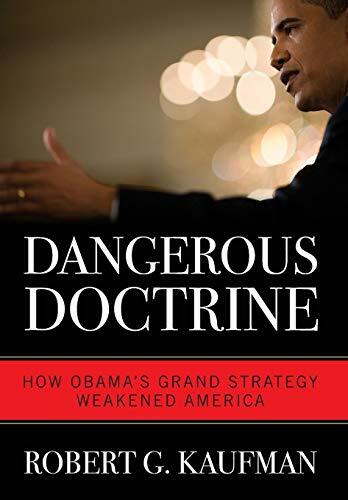 Kaufman, who previously authored a well-received biography of the late Senator Henry M. “Scoop” Jackson, deduces the existence of an Obama Doctrine from the president’s speeches and, more importantly, from the policies pursued by the administration. The Obama administration has manifested its liberal multilateralism, according to Kaufman, by its failure to adequately respond to Russian aggression in Eastern Europe; its reluctance to contain China in the South China and East China Seas; its military withdrawal from Iraq and Afghanistan and failure to counter Russian and Iranian moves in Syria and the greater Middle East; its refusal to directly confront radical Islam; and its dangerous reduction of America’s military forces. The author’s indictment of Obama’s foreign policy is based on Kaufman’s worldview that hews to the classical geopolitical notion that the U.S. security depends on a politically divided Eurasian landmass, especially in Europe, Asia, and the Middle East. This outlook is traceable to the geopolitical writings of Sir Halford Mackinder, Nicholas Spykman, and Alfred Thayer Mahan. There is no evidence that President Obama sees the world this way. Kaufman’s description of the president’s worldview seems accurate enough. America under Obama has retreated from global leadership and that retreat has had consequences. But that does not mean that there is an Obama Doctrine. Obama came into office determined to withdraw from two unpopular and indecisive wars and focus on domestic policy. Stimulating the economy, healthcare, and civil rights topped the agenda. Moreover, the return of the world to multipolarity was likely to happen no matter who became president in 2009. Exhausted by seemingly endless wars, Americans were ready to retrench a bit. The so-called “unipolar moment” was just that—a moment, destined to disappear as China and India continued to rise economically and militarily and Russia reasserted itself under Putin’s leadership. Obama’s worldview, in fact, differs little from the conventional Democratic Party approach to foreign policy since the mid-1970s when, in the wake of Vietnam and Watergate, the McGovernite wing of the party took control. It was, after all, this phenomenon that led many Democrats of the Henry Jackson wing of the party to break ranks and support Ronald Reagan for president in 1980 and 1984. Kaufman persuasively argues that China’s aggressive actions in the Indo-Pacific region, Russian imperialism in Eastern Europe and the Middle East, and the potential Iranian nuclear threat all imperil U.S. interests in Eurasia, and that the Obama administration’s responses to these developments have been inadequate. His recommendations for a more robust exercise of American power, a larger defense budget, and a return to a grand strategy based on classical geopolitics have considerable merit. But Kaufman’s insistence on including the promotion of democracy as part of that grand strategy rings hollow. It harkens back to the worst features of the so-called “Bush Doctrine” that sowed the seeds for our failures in Iraq and Afghanistan.